With the 2018 season over and the winners crowned, it is time to take a moment to recognize the top European performers in the Mixed Division this season. While the talent of the Division reaches far beyond short lists, these awards are meant to honor those players who put together what we believe to be the best seasons in the Mixed game this year. Bcause of the nature of the Club Division, we weighted success at WUCC and at European Championship events above all else. The awards are selected based on input from Ultiworld reporters, contributors, and editors. Floor Keulartz is 19 years old, and she very well may be the best female player in Europe. Keulartz lead Netherlands’ GRUT to win Windmill, finish top eight at WUCC, and win the EBUCC late in the season. Aside from that, she was instrumental in the Dutch U20 team’s incredible fifth place finish at WJUC, which included a double game point loss to the eventual gold medalists, USA. This was the closest any team came to beating the Americans all tournament. She has developed into the complete package as a player. In previous seasons, she tended to just be a deep receiver on GRUT. Certainly, if you give her a meter deep, she will absolutely burn you, but this year, she showed more and more that if you back her, she will come under and throw a flick bomb the full length of the field if she needs to. 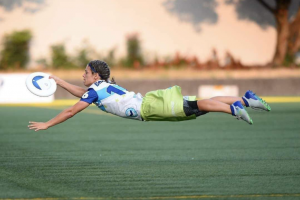 If GRUT turns it over with their high risk, high reward hucks, she will also very likely be the one to get the disc back with a huge layout D.
She is by far the most powerful woman in the Mixed Division, and if there is any all-star draft of mixed players, she should be anyone’s first pick. Steffen Döscher had an incredible season this year, as did his club, Hässliche Erdferkel. The man was a menace in the cutting lanes. 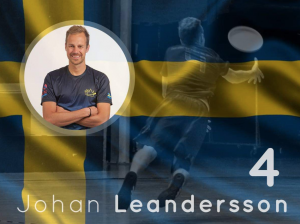 He got 36 goals and 11 assists at the WUCC this year, making him second overall on the stat sheet in the Division and the number one European. Steffen chased down a lot of hucks from teammate Chris Hamman and worked well cutting in tandem with Nora Wilkening. 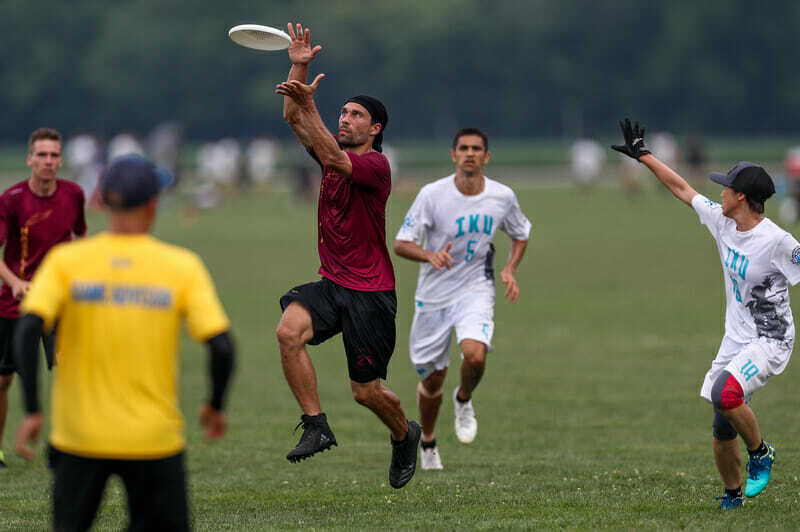 They played some of the best offense of any team this year, not conceding a break at day one of WUCC and finishing 7th overall, tied with rivals GRUT. Chris Hamman had 42 assists at WUCC, most in the Division, and not a single goal. This tells you a lot about Chris. He is a quarterback, a handler in its purest form. Having the likes of Nora Wilkening and Steffen Döscher downfield helped get stats on the board, but he was also very solid at maintaining possession. GRUT may be the team known for creative throws and blades, but Hamman knows how to match them, making the Hässliche vs. Grut matchups exceptionally entertaining. Although the germans lost their last three games against GRUT 15-14, Hamman was very impressive and always gave a clinic in crossfield blades. Walt Jansen has been the definition of a deadly receiver for some time now. The “Skywalker” knows exactly how to use his long length and leaping ability to handle almost any sky battle he gets himself into. However, like his teammate and mixed POTY, Floor Keulartz, he has shown the throwing skill to make huge impressive inside out hucks, where he can seemingly hit any spot on the field with ease. He was GRUT’s stats leader with 19 assists and 26 goals at WUCC, and he notched 13 goals and 21 assists at the EBUCC on GRUT’s road to a title. Jansen is a truly dangerous player offensively and was key to GRUT’s offensive success every step of the way this year. Lola Dam may be the fastest woman in the Mixed Division. 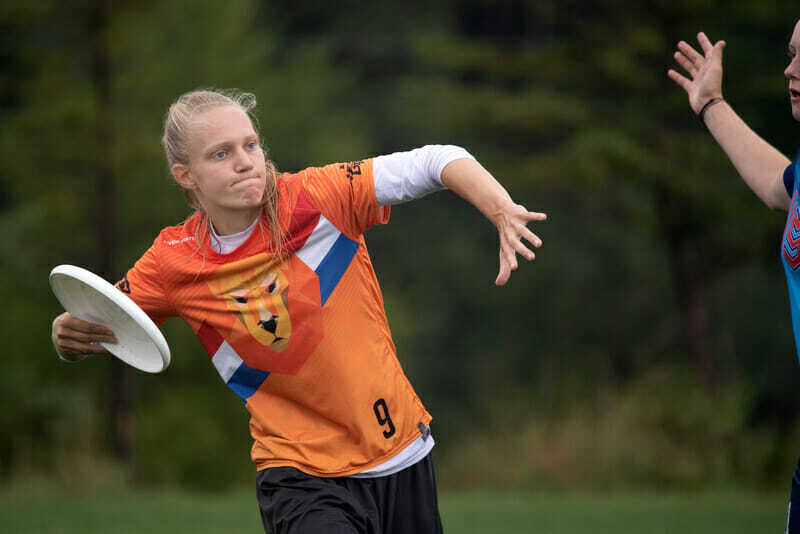 On GRUT’s defensive line, she consistently takes the strongest matchup and ensures they will have a very tough time getting the disc. She is very intelligent about shutting down her person on defense. 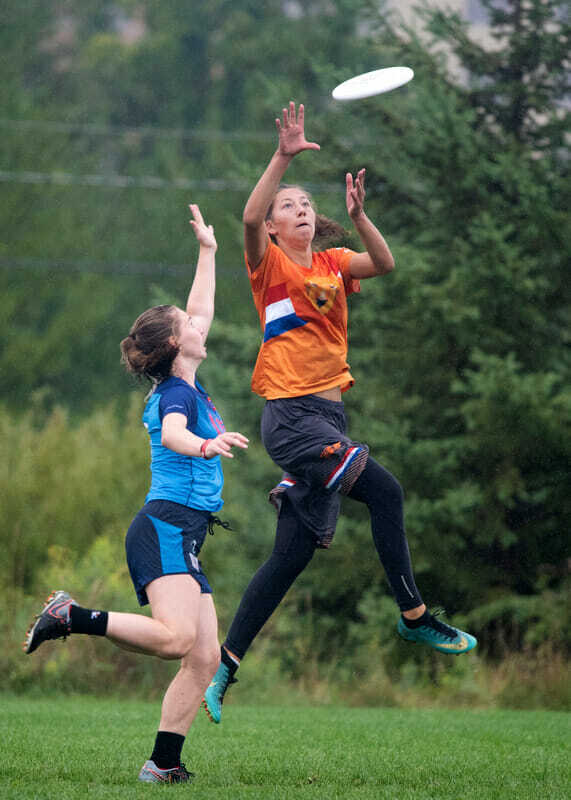 If opportunity arises, she can spring into action to get a layout block or sometimes just chase down a disc that would seem to be completely out of her reach when it leaves her opponent’s hands. This is, of course, a defensive mixed award, but you cannot write a blurb on Dam without mentioning her staggering offensive performance on the Dutch U20 team, where she demolished the Women’s Division in stats with 13 assists and 46 goals. Dam adds a scary amount of pressure to GRUT’s D-line and if GRUT get the turn, then it’s a pretty safe bet that she will be scoring the break as she streaks deep and will steps ahead of anyone who dares to try and guard her going the other way. Johan was a talisman on the SeE6 D-line, a tall, experienced player they could rely on to get blocks and score breaks. The Swedish outfit never made it to Cincinnati but turned up at EUCF to take home the gold. Leandersson scored the winning goal with a layout catch, upsetting the favorites Hässliche Erdferkel in a clinical final performance. They also had a solid performance at Windmill, finishing fourth. Leandersson has been part of many a successful Swedish team through the years, earning him some recognition and a reputation for good spirit. Sweden have a habit of not sending teams to big tournaments, but when they do, they often win. Never underestimate the Swedes, it’s probable they’ll turn up to defend their ECBU mixed title next year with a strong squad. Lawko Van Der Weiden has been a key role player on GRUT for the past couple seasons, but this year broke out in a big way to be a key contributing handler for the team when they reached the largest stages. With Ben Oort injuring his main throwing thumb right before WUCC, GRUT needed a gunslinger to help fill in the gap left behind as Oort’s throwing was extremely limited. Van Der Weiden took up that role and played it beautifully. He moved from being just a solid reset handler to being a solid reset handler with a dangerous deep throwing arsenal. 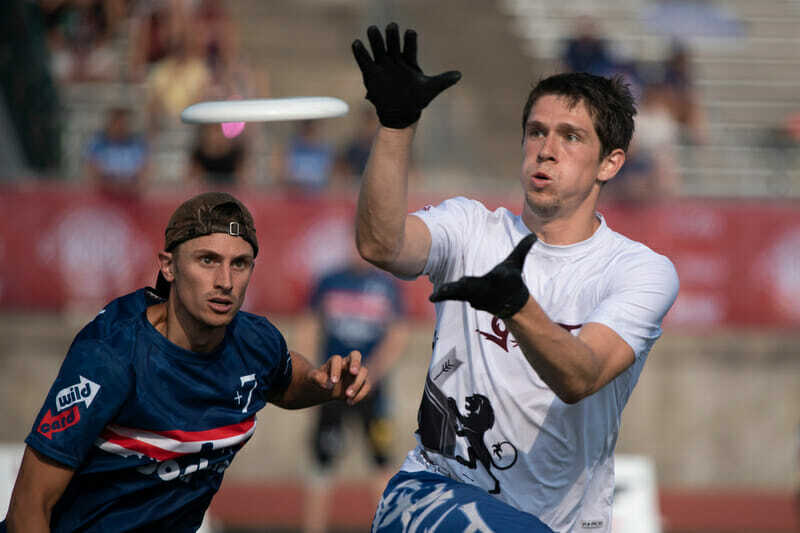 He tallied 34 assists and 10 goals at WUCC, second only to Walt Jansen in stats for GRUT. Don’t let his throwing prowess fool you. While he doesn’t have the top speed and big stature of some of his teammates, he has an incredible ability to recognize when his defender is the slightest step off to punish them with a deep cut as well. He did exactly this by going deep from the handler spot to catch the final double game point score in the EBUCC final, giving GRUT another gold to add to their trophy shelf. Ines Bringel on the Eurostars Tour. Ines Bringel has been a standout player in beach ultimate for several years, playing successful seasons with the Portuguese national team and club team UFA. However, this year she really burst onto the grass ultimate scene. She had a fantastic season with the Eurostars, connecting very well with Luci Otal and Isa Prada. It was obvious that she has upped her training, as she made great athletic bids on defense. Her club team Vira O Disco came 2nd at EUCR-S, earning them a spot at EUCF, but they declined to attend. Instead, Bringel and some teammates joined forces with Lisboa to make a stronger squad. Bringel was key in earning them a spot in the semifinals, where they lost to the eventual champions, SeE6, on double game point. This is something we haven’t seen before from a Portuguese club team on grass. Perhaps it is a sign of things to come, as ultimate in Portugal is on the rise. Comments on "2018 European Mixed Club Awards"